Dr. Ladislaus Weinek was Chief Astronomer on Karl Borgen's expedition on the Gazelle (Headland 1073) to Kerguelen Island to observe the Transit of Venus from Betsy Cove, one of a series of German, British and American expeditions sent south to observe the Transit. Kerguelen Island was discovered by the French navigator Yves Joseph de Kerguelen-Trémarec in 1772 and was visited by Cook in 1776 before being occupied in 1874-1875 by the numerous expeditions sent to observe the Transit of Venus. Annexed by the French in 1893, the island lies approximately midway between the Cape and southwest Australia. 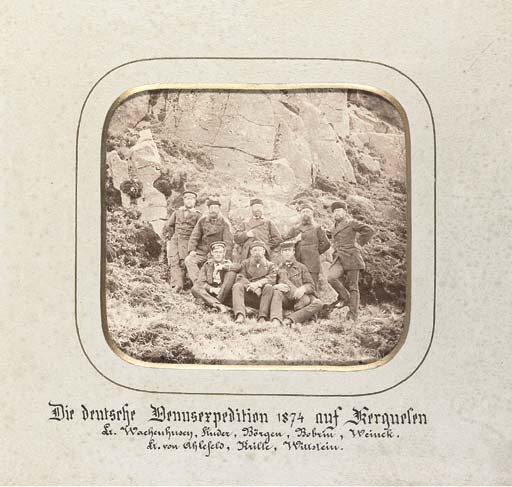 Twelve of the photographs in the present album illustrate the return of the expedition up the west coast of Africa including scenes at Monrovia, Liberia and the Congo.